(Coming back to this series post Winter Meetings hoopla). Fourth in our set of Draft class Reviews for the 2016 season. First was the 2016 class, then the 2015 class then the 2014 class. This review is especially important to follow because the college-age draftees in this 2013 class are Rule-5 eligible this coming off-season. I think its a big reason why several of these guys are in the AFL right now, and their performance may or may not influence the team’s decision to protect or leave exposed. We’ll put a pin in this post when we eventually do Rule-5 Analysis later this month. Kaminsky: 11-7 with a 3.28 ERA in a full season starting for AA in his age 22 year. Was flipped in 2015 to Cleveland from St. Louis (his drafting team) in the Brandon Moss deal. Manaea: 7-9 with a 3.86 ERA in 24 starts for Oakland this year. Was flipped in 2015 to Oakland from Kansas City (his drafting team) in the Ben Zobrist deal. Stanek: split time between AA and AAA, was removed from the rotation and struggled in relief. Clarkin: went 6-9 with a 3.31 ERA in High-A as a 21-yr old after losing all of 2015 to injury. I’ve more than said my peace on how much I disagreed with the Soriano signing and its opportunity cost. Lets move on. Round 2: Jake Johansen, Coll Sr. RHP (Starter, now a Reliever) Dallas Baptist U. 4-1 3.19 ERA across 3 levels in 2016. 29/22 K/BB in 36 2/3 mostly middle relief innings. 1.64 whip. Johansen started the year in Potomac, walked 11 guys in 6 appearances and was dumped back to XST. Once the GCL started he threw a few innings in Florida before joining Hagerstown for the rest of the year. He had 11 appearances and 19 IP in Low-A with good numbers … but at this point in his career (he’ll turn 26 in a couple of months) and given where he was drafted, the fact that he can’t seem to cut it anywhere above Low-A ball seems like a pretty succinct judgement of the pick. I’m guessing he hangs around until he hits 6-years in the system, but any hopes of him turning into even a marginal middle reliever seem shot. If he was anything other than a big-bonus 2nd rounder he would have likely been released already. He’s toiling in the AFL and (as of this writing) had only given up one run in 9 innings, but had a measly 3 punch-outs against the elite hitters of the minors. With any luck, this confidence boost will carry over into 2017. Trending Down. Round 3: Drew Ward, HS 3B. Slashed .252/.348/.412 across 2 levels, ending the year in Harrisburg. 121/56 K/BB in 408 ABs, 14 homers. Ward’s age 21 season went pretty well; he started the year in Potomac but posted an .868 OPS there in 53 games to force his promotion to AA. He hit just .219 once he got there though, which means we’re likely seeing him back there in 2017. His strikeout rate remains a problem: 121 Ks in 408 Abs is a 30% clip. But the team clearly rates him; he’s in the AFL for the 2nd straight off-season and is hitting .327 against the best the minors has to offer. And he was a 21 yr old in AA; lots of 21 yr olds are still in Short-A. He’s also starting to get some prospect notice; generally getting ranked in the 12-15 range in the system. I’m going to say Trending Up … lets hope he can put up .800 OPS figures in AA in 2017. 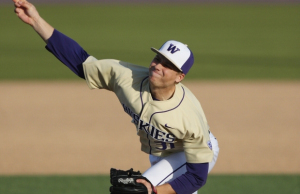 Round 5: Austin Voth, Coll Jr RHP (starter) UWashington: 7-9, 3.15 ERA in 25 starts for AAA Syracuse. 133/57 K/BB in 157 IP, 1.24 whip, 3.53 FIP, .279 BABIP. Another year, another solid season for Voth. I’m not sure what else there is for him to accomplish in the Minors at this point; he seems to be the pitcher that he is. His BABIP was in-line with his career numbers, he’s slightly regressed in a K/9 rate since arriving at AAA, and his ERA seems to be in line with his career numbers. As discussed in this space earlier this year, I’m not quite sure why the team didn’t add him at the 9/1 roster expansion date; clearly they’re going to add him ahead of Rule-5 (which they did) but instead chose to leave him on the sidelines while they had September tryouts for Mat Latos. Clearly he’s behind several of his AAA rotation mates on the depth chart, but I feel like he could still be a valuable rotation member for the Nats or someone else. Given our starter depth, one has to think he’s trade bait at this point (he’s behind Lopez, Giolito and Cole clearly). He seems like the kind of guy a team like Oakland would love. Trending Up. Post writing update: with the firesale of Nats SP candidates, Voth suddenly is like 2nd in line for getting MLB starts, so we look forward to seeing him in a Nats uniform at some point in 2017 and seeing if he’s the 2nd coming of Tanner Roark … or if he’s more like Taylor Jordan. Round 6: Cody Gunter, Juco 3B/RHP (reliever) from Greyson College: 0-0 in 2/3rds of an IP for GCL before getting shutdown for the season. He looked halfway decent for Auburn in 2015 while converting from his drafted position (3B) to the mound, but 2016 is a big step-back. I don’t know what to expect in 2017; perhaps a shot at the Hagerstown pen or an outright release. Trending Down. Round 7: Jimmy Yezzo, Coll Jr 1B from UDelaware. Released on 7/22/15. Played a full season with the Washington PA team in the Indy Frontier League, hitting .220. 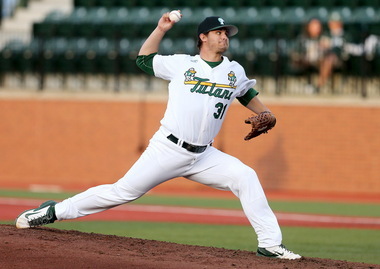 Round 8: David Napoli, Coll Sr LHP (relief) from Tulane. Released 3/16/16 after four seasons where he never got above A ball. Round 9: Jake Joyce, Coll Sr RHP (reliever) from Va Tech. Released in 7/7/14. Round 10: Brennan Middleton, Coll Sr SS/2B from Tulane. Released on 6/30/15. Round 11: John Simms, Coll jr RHP (starter) from Rice. 8-5, 3.30 ERA in 29 games (11 starts) for AA. 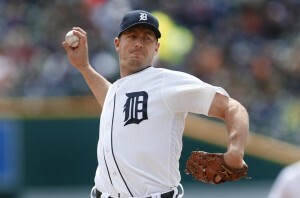 79/28 K/BB ratio in 92 2/3rds innings, 1.08 whip, 3.84 fip, .254 babip. Simms was the opening day starter for Harrisburg in 2016, but never seemed destined for the rotation; he was mostly a long reliever/spot starter, never throwing even 90 pitches in an outing. He did not go to the AFL this year after going last year; what is his planned usage going forward? His numbers look good; is he destined to move up to AAA and be a 6th starter again? He seems to be able to compete, so we’ll see how he does against more veteran/mature competition in 2017. Trending Steady. Round 12: Andrew Cooper, Juco RH relief pitcher from Sierra College. Released on 1/12/16, not even getting a chance to compete for a spot in the High-A bullpen. Seems like the team let him try to earn his way up on the field and it never happened. Round 13: John Costa, Juco RH relief pitcher from Palm Beach CC. Released 4/1/15. Round 14: David Masters, Juco SS/3B from Central Arizona College: Slashed just .174/.259/.280 with 56/23 K/BB in 236 ABs in High-A. 6HR, 1SB. Masters seemed to play every other day in a utility role for Potomac, posting anemic batting stats but staying with the team the whole year. I thought he was in trouble after hitting just .226 LAST year but he stuck around the whole season. I said this last season, but it seems like Masters isn’t long for the organization. Trending down. Round 15: Isaac Ballou, Coll Sr OF/CF from Marshall (via Germantown, MD). Slashed .255/.332/.386 mostly for AA Harrisburg. 77/42 K/BB in 373 AA at-bats, 6hr, 7SB. Ballou split time between the corner OF spots and had a couple of stints covering for Syracuse. Ballou didn’t stick as a starter in AAA, instead repeating AA for the most part. Depending on how the MLB roster numbers shake out, he may have the same issue in 2017. Trending Steady. Round 16: Willie Allen, Juco Corner OF from Oklahoma/Newtown, MA. Did not sign; transferred to Lewis-Clark State (ID), where he played for a year in 2015, then has apparently disappeared. He was not on their 2016 roster, and he does not appear to still be playing. Round 18: Cory Bafidis, Coll Sr LH relief pitcher from Texas Wesleylan. Released 7/7/2014. Round 19: Niko Spezial, Coll Sr LH relief pitcher from Wake Forest. Released 5/28/14. Round 20: Brenton Allen, Coll Jr Corner OF from UCLA. Released 6/21/14. Round 21: Justin Thomas, Coll Sr LH relief pitcher from Southern Arkansas. 3-2, 4.75 ERA while repeating High-A. 36/21 K/BB in 47 1/3 relief innings, 1.37 whip, 4.50 fip, .281 babip. Last year I liked Thomas and thought he’d easily move up to AA. Didn’t happen; he repeated Potomac and his numbers went down. His lefty-lefty splits aren’t especially good, which precludes his value as a lefty specialist, so I wonder what his role is going forward at this point. I’d guess he’ll compete for AA spot but may be a release candidate. Trending down. Round 22: Cody Dent, Coll Sr SS from UFlorida. Released 7/15/16 after getting demoted out of High-A and hitting just .195 as a 24-yr old in low-A. Even his pedigree (he is the son of legendary Bucky Dent) couldn’t save him. Round 23: Garrett Gordon, Juco Corner OF. Released in 3/26/15. Round 24: Matthew DeRosier, Juco RHP (starter/reliever) from Southwestern College (CA). 3-3, 4.54 ERA in 14 low-A starts before hitting the D/L on 6/30/16 for the rest of the season. 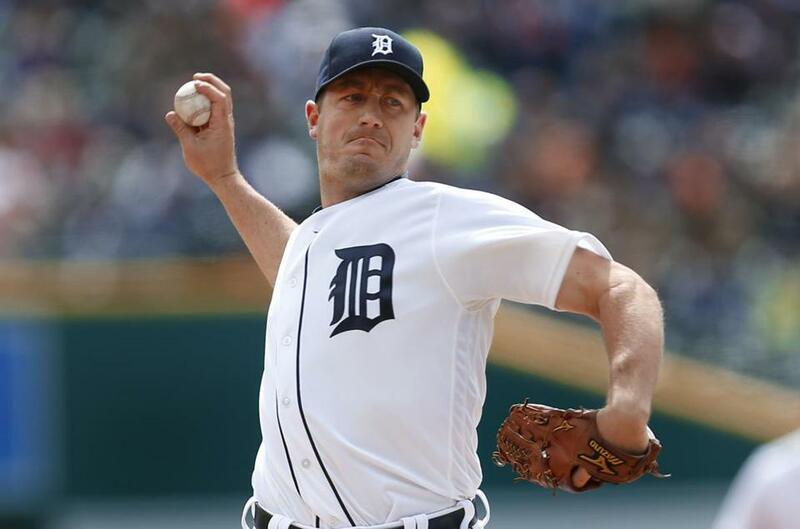 59/18 K/BB in 67 1/3 innings, 1.32 whip, 3.25 fip, .325 babip. 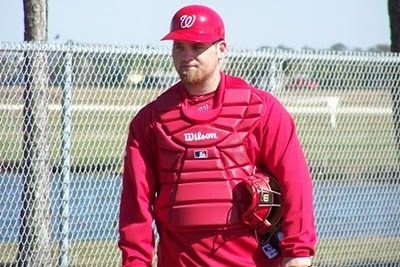 DeRosier was in the opening day rotation for Hagerstown and lasted there for 3 months before getting hurt. DeRosier was a young JuCo signee; he just finished his 4th pro season but he turned 22 in July, so we’re not too worried that he’s still in Low-A. But he needs to start making some progress before he ages out of the system. His FIP is better than his ERA, but we have no idea what the injury was. I’d guess he’ll compete for the Potomac rotation in 2017. Trending Steady. Round 25: Travis Ott, HS LH starting pitcher. Traded 12/17/14 along with Steven Souza in the Trea Turner/Joe Ross deal. Repeated Short-A for the *third* year and was phenomenal in 2016. Why keep him there? I know Tampa is “conservative” when it comes to promoting pitching prospects, but keeping a talented HS pitcher in the same classification for three years running seems dumb. Round 26: Garrett Hampson, HS SS from Reno, NV. Did not sign; honored commitment to Long Beach State. Had a monster collegiate career and was drafted in the 3rd round by Colorado. Signed a $750k bonus and had an .845 OPS in Short-A Boise. Could be one that got away. Round 27: Bryce Harman, HS LH starting pitcher from Richmond, VA (Byrd HS). Did not sign; honored commitment to East Carolina University. Hit .242 his Junior year starting and was not drafted. Round 28: Joey Webb, Coll Sr LH relief pitcher. Released 6/25/15. Round 29: Mike Sylvestri, Coll Sr RH relief pitcher. Retired on 6/13/14. Round 30: Ryan Ullmann, Coll Sr RH Starting pitcher. Released 6/25/15. Round 31: Willie Medina, Coll Sr SS. Released in Jan 2015. Round 32: Pat Boling, Coll Jr LHP: Did not sign, chose to return to U. of Georgia for his senior season. He posted a 4.94 ERA his senior year, was not re-drafted, and does not appear he played any independent ball. Round 33: Andrew Dunlap, HS C/RHP from Houston. Did not sign. Honoring a commitment to Rice University. He has struggled to find the field for Rice, not playing in 2014 or 2015 and hitting .197 in limited PT his junior year in 2016. Round 34: Jake Walsh, Coll Sr LH relief pitcher. Released 3/16/16, before the season started. This one I still do not get to this day. Look at his minor league numbers: he has a career 1.65 ERA!! All his peripherals look good. I just don’t get this at all. I thought he’d be at least in the AA rotation in 2016; instead he’s out of the game. Round 35: Lukas Schiraldi, Juco RHP from Texas. Did not sign; instead transferred to U Texas. Drafted in 2014 in the 15th round by Seattle; in 2016 he struggled with the jump to High-A (with the caveat that he’s in the California league). Round 36: Reid Humphreys, HS SS from Missouri. Did not sign. Honoring commitment to Mississippi State. Drafted in the 7th round in 2016 by Colorado, signed for $227k, and threw a few games in the rookie league. Btw, he converted to the mound in college and is now a RHP reliever. Round 38: Caleb Hamilton, HS SS from Washington State. Did not sign; honoring commitment to U of Washington. He was drafted in the 23rd round this year by Minnesota and signed. He hit .207 for their rookie league team. Round 39: Robbie Tenerowicz, HS 2B/SS from California. Did not sign; honoring commitment to UC Berkeley. He was drafted in the 27th round this year by Tampa Bay and signed. He hit .291 with some pop for their rookie league team. Round 40: Shaun Anderson, HS RH starting pitcher from Florida. Did not sign; honoring commitment to U of Florida. At Florida he was a significant part of their pre-season #1 team, serving as the closer. He was drafted in the 3rd round by Boston, signed for $700k, and then gave up 12 hits and 9 runs in his Short-A debut. He’ll try it again fresh in 2017. Wow; this class is really looking poor. Just two players who I still think are trending up in Voth and Ward. And even though I rate Voth, I sense he’s perhaps he’s limited to being a 4-A/5th starter. As noted before, no 1st rounder and a blatant fail on Johansen the 2nd rounder have made this class look pretty weak. It’d look a bit better if Ward (3rd rounder) turned out, but the cashing in of the 4th rounder (Pivetta) for a short-term head case rental looks equally wasteful in hindsight. On the bright side … it makes Rule 5 decisions pretty easy. We’ll circle back to this post when we do the Rule5 analysis, but right now the only candidate here worth protecting is Voth. (Update post-writing: we were right; the only one added was Voth and nobody here got drafted). Wow, no inboxes for months and suddenly two in two weeks?? It must be spring training! This is great! MLB.com’s Nats beat reporter Bill Ladson on 2/20/16 has published more reader questions. Here’s how I would have answered them. Q: Without a doubt, Bryce Harper will be the best hitter on the Nationals this year. Who do you see as being the second-best hitter on the team? A: Anthony Rendon. 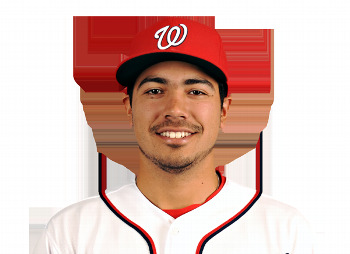 If this team is going to win in 2016, Rendon needs to return to form. Everyone else at this point in the lineup will be a table setter for Rendon and Harper. Ladson says Zimmerman, who I admit i’ve begun to lose faith in. Q: How does the front office justify bringing back Jonathan Papelbon after what happened last year with Harper? Papelbon has proven time and again that he is not a good teammate, yet he’s back for 2016? A: I guess the questioner didn’t know that Papelbon was still *signed* for 2016. 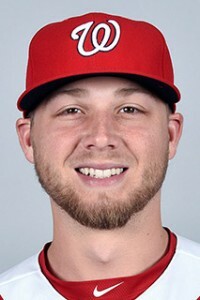 So it wasn’t so much about “bringing him back” on purpose as it was the team “not being able to get rid of him.” I put the Papelbon acquisition as one of the worst of the Mike Rizzo tenure; not so much for who we gave up (a good but not game changing prospect in Nick Pivetta) but for the incredible mis-calculation of the acquisition’s affect on the rest of the team. I’m sure the team desperately tried to move him in the off-season but (with echos of “Lerner’s are cheap” abounding) probably weren’t willing to dump him for no return. So here we are; its 2016 and Papelbon is here in lieu of the home grown popular (and team union rep) Drew Storen. I’ll bet Rizzo doesn’t make this mistake again. Nonetheless, Papelbon said the right things in his first media interviews since the interview, actually managing to appear humble and contrite while talking about how he was in the wrong and flat out apologizing to the fans. I say good for him; even I couldn’t help but applaud his performance last last week. Ladson says the team “made a good decision” in not moving Papelbon; yeah right. If they could have gotten *anything* for him he’d be gone. You worry about “finding a closer” in the current bullpen? Uh, how about anyone? We don’t need to go into more historical reviews of the uselessness of closers vis-a-vis teams holding leads after 8 innings. Q: Why did the Nats not re-sign Craig Stammen? Before last year, I thought he did a great job as a middle reliever. A: It all came down to risk mitigation. Stammen absolutely did a great job for this team for many years … but he’s got a lot of innings, is coming off of a season-long injury, has (to be fair) rather funky mechanics, and the team just couldn’t justify guaranteeing him what probably would have been $2.5M or so for the unknown. 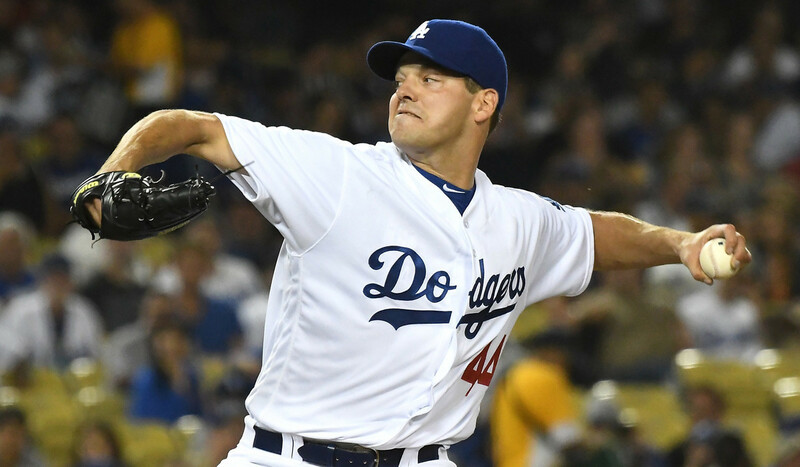 The industry felt the same way: Stammen ended up with a non-guaranteed minor league deal with Cleveland instead of either a major league deal or anything of significant value. Trust me I was bummed; we met Stammen years ago at a golf event and he was awesome; hate to see these long-time Nats leave. Ladson basically says the same thing. Q: Don’t you think it’s time to improve left field? Jayson Werth is not the player he used to be. He makes a lot of money and doesn’t provide much in return. A: And do what with Werth? Magically trade him for valuable assets and get his payroll off your books? The asker clearly thinks that the rest of the league are run by morons and the Nats can just magically get rid of the likes of Werth for value. Yes he’s costing you more than 10% of your payroll. It is what it is; veteran FA contracts all end up like this. Honestly, I think Werth still has a ton of value if you use him properly; that means batting lead-off where you take advantage of his high pitches-per-plate appearance and high OBP. We’ll see if Dusty Baker thinks outside the box like this (doubt it). Ladson says Werth is a comeback player of the year candidate. Q: What are the chances the Nationals make a trade for someone like Carlos Gonzalez to protect Harper in the lineup? A: I like Carlos Gonzalez … but his home/away splits are pretty distinct. .972 OPS in Denver, .758 OPS elsewhere last year. I’m not sure he’s anything more than a mediocre outfielder if he’s not playing half his games at altitude. Besides, the team made its play for the outfield when they acquired Ben Revere. Ladson thinks Rizzo could still “make a deal for a slugger” during Spring Training if he doesn’t like what he sees. Uh; trading season is over, dude. How many big-time sluggers can you think of that moved in spring training? Q: A prime component of the Mets’ rotation is the ability to throw hard and get a bunch of strikeouts, but how unique is the Nationals’ rotation and how could it help them win the NL East next season? A: Indeed, the Mets have a plethora of big-time arms throwing big-time heat. But the Royals buzzed through their staff with ease in the World Series. Why? Because the Royals were the best team in the league for not taking a strikeout and putting the ball in play. So once it became apparent that the Mets starters couldn’t close out games by themselves, the Royals (with their superior bullpen) outlasted them. So Ks are important but not the end-all/be-all. What makes the Nats rotation unique? Two part answer for me: they (still) have one of the best 1-2 punches in the league in Scherzer and Strasburg. What other 1-2 starters would you take over them? So then past their 2 aces, they have three other guys who are dangerously under-rated. Gonzalez was a Cy Young finalist just a couple years ago and he still has the same stuff. Ross is a complete find, a guy who would be most teams’ #2 starter this year despite just having a handful of MLB starts. And (as often repeated) Roark was a 5-win guy two years ago. So the potential is there for this to be a top rotation end-to-end. How does the Rotation help them win the NL east? By staying healthy, pitching to potential, and outlasting the Mets own powerful rotation when its crunch time. Ladson doesn’t really give much of an answer here. He just says what he’d like to “see” each of our starters do this year. The next in a series: previously we reviewed the 2015 season stats for the 2015 draft class and the 2014 draft class. Unlike these other two posts, this one was a bit easier to write. Why? Because I had done this analysis for the 2013 class previously … back in 2013. All I had to do was cut-n-paste that post and all 40 draftees were already listed with key details. Ahhh. I may continue this with previous classes since it was easier to compile. Hopefully I didn’t miss any obvious promotions for key guys like I did previously. Kaminsky: so far, looks pretty good. Career 2.22 ERA across multiple levels, finishing this year in High-A. Flipped this year to Cleveland from St. Louis (his drafting team) in the Brandon Moss deal. Manaea: looks awesome after some injury issues in 2013. Finished 2015 going 6-0 with a 1.93 ERA for Midland in AA and was a key prospect going to Oakland in the Ben Zobrist deal. I really liked him in 2013 and thought his hip injury bumped him down the line from being the top 10 talent he was initially projected to be, and nothing he’s done professionally has countered that. Stanek: dominated high-A for Tampa Bay this year, finished the year in AA. Clarkin: drafted by the Yankees, pitched his first full season of pro ball in low-A (impressive), giving Charleston 16 decent starts. Hurt his elbow in 2015 spring training and didn’t pitch all year, but is apparently recovered and is now pitching in the AFL. I dunno. I hate to sound like a repeating record on the Soriano signing, but it looks even worse know knowing who we could have had. Knowing how Mike Rizzo loves college arms, you have to think he was likely looking at either Manaea or Stanek, and both those guys are looking like mid-rotation starters perhaps by mid 2016. 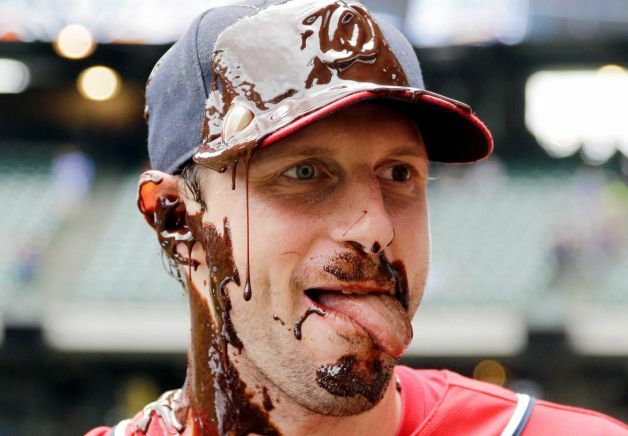 All for an overpriced malcontent closer we didn’t need and who was eventually supplanted from the role by the same in-house option (Drew Storen) who the team AGAIN tried to supplant with another unnecessary over-priced malcontent (this time Jonathan Papelbon) in 2015 to disastrous results. Do you think Rizzo and Lerner have learned their lesson by now? Round 2: Jake Johansen, Coll Sr. RH Starting Pitcher Dallas Baptist U.. 1-7, 5.44 ERA with 48/27 K/BB in 48 relief IP, 4.69 fip, .358 babip for Potomac this year. He was pushed to the bullpen full time for 2015 yet was, frankly, awful in relief. This is on top of his 5.19 ERA in 2014 in Hagerstown. This pick is looking more and more like a disaster. I don’t see any silver linings here, other than his K/inning rate (which is thrown off by his 4.5 walks/9 inning rate for his career). Trending Down. Round 3: Drew Ward, HS 3B. Slashed .249/.327/.358 with 110/39 K/BB in 377 Abs, 6hr for High-A Potomac. Missed a month with an injury, but otherwise took incremental steps back on his performance from his 2014 campaign in Low-A. Where’s the power? Slugging .358 isn’t great, especially for a corner infielder. But there doesn’t seem to be anyone else really preventing him from suiting up for Harrisburg as the starting 3B in 2016. Also worth remembering; he’s a HS draftee so he was a 20-yr old in High-A; quite young. That tempers any criticism. He’s in the Arizona Fall League, a good sign for the team’s opinion of him, so even my opinion may be slightly conservative. Trending Steady. Round 4: Nick Pivetta, Juco RH Starting Pitcher. 7-4, 2.29 ERA for Potomac in 2015 before getting traded to Philadelphia for Jonathan Papelbon. Was working on a nice improvement over his 2014 campaign for Hagerstown (13-8, 4.22 ERA). Was bumped up to Philly’s AA affiliate in Reading PA and struggled to finish out 2015. Round 5: Austin Voth, Coll Jr RH Starting Pitcher: 6-7, 2.92 ERA and 148/40 k/bb across 157 ip (28 starts) for AA Harrisburg. 3.07 fip, .284 babip. Another excellent campaign after his three-level jump in 2014. He’s now regularly mentioned in the back-end of Nats top 10 prospect lists and seems like he could be one of the first options considered in 2016 if a MLB starting pitcher gets injured. Looks like a steal of this draft and could be the best player to come out of it by the time all is said and done. Trending Up. Round 6: Cody Gunter, Juco 3B: 1-0 4.15 ERA, 23/8 K/BB in 21.2 IP for Short-A Auburn, 3.84 fip, .259 babip. Gunter was drafted as a 3B and after two non-descript seasons in Auburn converted to the mound. so far, results look promising; he maintained a K/inning ratio with good control and could be better based on the ERA-FIP delta. I see him getting pushed to the Low-A bullpen in 2016. Trending Steady. Round 7: Jimmy Yezzo, Coll Jr 1B. Slashed .192/.250/.256 with 36/13 K/BB in 49 games at Potomac, with just one homer, before the team pulled the plug and released him on 7/22/15. Yezzo showed some power in Low-A in 2014 (13 homers in 123 games) but clearly not enough to justify keeping him around as a 1B-only player. This was always going to be the jeopardy with drafting him; he was positionally limited from the start and, despite a great college campaign, couldn’t make the transition in pro ball. Immediately after his release he picked up with a Frontier League team, finishing out the season, so hopefully he gets another shot. Round 8: David Napoli, Coll Sr LH relief pitcher. Went 7-5, 4.01 ERA with 62/36 K/BB in 60 relief IP mostly for LowA Hagerstown. 3.57 fip, .289 babip. He started with Potomac but spent most of the year in Hagerstown, despite turning 25 during the season. If anything, his numbers took a step back from his 2014 Hagerstown campaign, and given his age and the glut of arms in the system, time may be running out. Or maybe not: i mean, he signed for $15k and basically cost the team nothing and eats innings; that kind of guy is useful to have around. See McGregor, Scott for AAA the last couple of years. Trending Down. Round 9: Jake Joyce, Coll Sr RH relief pitcher. Released in July 2014 as the 2014 signees started reporting to Vermont after just one season in Auburn where he posted a 5+ ERA. A cheap, senior sign who had to do more to impress and stick around as Napoli has done. Round 10: Brennan Middleton, Coll Sr SS/2B. Slashed .198/.252/.264 for half a season while repeating LowA despite his age and was summarily released in July 2015. Senior sign, low bonus figure, poor performance all contributed. Round 11: John Simms, Coll jr RH relief pitcher. 6-6, 2.74 ERA with 48/25 K/BB in 88.2 (15 starts) for Potomac. 4.15 fip, .236 babip. Earned a mid-season promotion and ended the season with 6 starts in Harrisburg’s rotation. Excellent season-over-season improvement for Simms, who will look to do the same thing in AA’s rotation for 2016. The team clearly sees the same potential and sent him to the Arizona Fall League this year. Trending up. Round 12: Andrew Cooper, Juco RH relief pitcher. 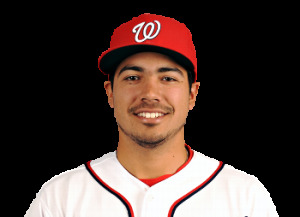 2-2, 3.53 ERA with 35/16 K/BB in 63.2 relief IP for LowA Hagerstown, 3.63 fip, .283 babip. Improved his numbers across the board while repeating LowA. Still isn’t getting the K/9 we’d like to see though. He’ll be 24 in High-A next year in what probably is a make or break season. Trending Steady. Round 13: John Costa, Juco RH relief pitcher. Released 4/1/15 after being injured most of 2014. Without knowing the details, I’d guess that whatever injury he suffered was a career ender, that he couldn’t show enough improvement in spring training 2015 to merit keeping around. Tough break. Round 14: David Masters, Juco SS. Slashed .226/.311/.285 with 69/40 K/BB in 354 Abs, 2hr, 3SB mostly in LowA, missed most of May and June. Did earn a promotion to HighA in August to finish out the season. With so many MIF in the system and the likes of Chris Bostick blasting homers in the AFL, Masters may not be long for the organization. Trending down. Round 15: Isaac Ballou, Coll Sr OF/CF. Slashed .271/.344/.397 with 82/47 K/BB in 431 Abs, 8homers 21steals CF/LF as he jumped two levels (from HighA to AAA) in 2015. A nice season from the local product (hails from Germantown, MD, went to Marshall U). An .876 OPS in AA greased the skids for him to move up the line. He has some speed (56 career SBs in 322 games) and can hit and can play all three OF positions; can he push the likes of Matt den Dekker for a utility OF spot on the big club? Maybe not for 2016, but a strong AAA campaign would help. Trending up. Round 16: Willie Allen, Juco Corner OF from Oklahoma/Newtown, MA. Did not sign; transferred to Lewis-Clark State (ID). Allen was an odd case at the time; it was literally impossible to find information on him. But he’s definitely playing college ball at Lewis-Clark now. Now known as “William Allen” if you’re trying to find him in various databases, fyi. Round 17: Geoff Perrott, Coll Sr C. released/retired (2015): never played in 2014 and no record of his official release in milb.com, but clearly he’s done playing. Round 18: Cory Bafidis, Coll Sr LH relief pitcher. Released July 2014 once the 2014 draftees started showing up in Auburn. This release has troubled me; he had decent numbers in 2013, then got axed after just 6 innings in 2014. Seemed too fast to me. Round 19: Niko Spezial, Coll Sr LH relief pitcher. Released in May of 2014, even before the draft. Only threw 19 innings in 2013 and none in 2014, not getting a full-team assignment and likely just losing out on the anticipated numbers game. Round 20: Brenton Allen, Coll Jr Corner OF. As with Bafidis, Released in June 2014 once the 2014 draftees started showing up in Auburn. He only hit .197 in Auburn in 2013 and was clearly replaceable with new 2014 OF draftees. Round 21: Justin Thomas, Coll Sr LH relief pitcher. 1-6, 3.43 ERA with 50/18 K/BB in 57.2 relief ip for Potomac. 2.84 fip, .300 babip in HighA. Oddly, he’s a lefty but he has much better L-R splits than loogy splits. But, he also wasn’t really used as a loogy, accumulating 57 innings in 28 games. He was more of a swing-man/innings sponge for the team despite never getting an official start. Good peripherals, good K/9 rates, I see him moving up to the AA bullpen easily. Nice find in the 21st round. Trending up. Round 22: Cody Dent, Coll Sr SS. Slashed .193/.257/.224 with 42/12 K/BB in 161 abs, 1hr, 2sb, mostly in LowA. Played 3B, got moved up to HighA and then went 0-24 in Potomac. He didn’t play after 7/31 but did not appear on any injury report; he was on the TIL for basically the rest of the season. The son of Bucky Dent seems to be getting similar treatment as Ryan Ripken and Cutter Dykstra (also sons of former MLBers); he’s hanging around despite poor numbers. How long can it last with all the MIF options moving up the line? Trending down. Round 23: Garrett Gordon, Juco Corner OF. Released in March of 2015; hit just .230 in Auburn in 2014 as a corner OF and, as with Allen above, was deemed replaceable with the 2015 crop of players rising up. Round 24: Matt DeRosier, Juco RH relief pitcher. 0-2, 3.58 ERA with 30/7 K/BB in 27IP (7 starts) mostly in the GCL, having gotten dumped out of Auburn after a couple of poor starts. 2.02 fip, .435 babip in Auburn, so perhaps it was a short-sample-size that was unflattering. He needs to put together a nice string of healthy starts somewhere outside of complex ball though. Trending down. Round 25: Travis Ott, HS LH starting pitcher. Traded 12/17/14 along with Steven Souza in the Trea Turner/Joe Ross deal. Despite his sterling short-A 2014 season, Tampa had him repeat the NY Penn league, where he was 6-3 with a 3.90 ERA in 13 starts. Odd. Round 26: Garrett Hampson, HS SS from Reno, NV. Did not sign; honored commitment to Long Beach State. Round 27: Bryce Harmon, HS LH starting pitcher from Richmond, VA. Did not sign; honored commitment to East Carolina University. Round 28: Joey Webb, Coll Sr LH relief pitcher. Released 6/25/15, losing out in the numbers game when the 2015 short-season college draftees started flowing in. Round 29: Mike Sylvestri, Coll Sr RH relief pitcher. Retired on 6/13/14 after struggling in low-A. Round 30: Ryan Ullmann, Coll Sr RH Starting pitcher. Released 6/25/15, in a similar fashion to Webb above. Round 31: Willie Medina, Coll Sr SS. Released in Jan 2015 after a mediocre season between LowA and ShortA in 2014. Round 32: Pat Boling, Coll Jr LHP: Did not sign, chose to return to U. of Georgia for his senior season. It does not look like Boling was re-drafted, nor does it appear he played any independent ball. Round 33: Andrew Dunlap, HS C/RHP from Houston. Did not sign. Honoring a commitment to Rice University. Round 34: Jake Walsh, Coll Sr LH relief pitcher. 2-1, 1.96 ERA, 32/14 K/BB across 36ip as he was promoted from LowA->HighA. 3.51 fip, .273 babip in Potomac. After starting the 2015 season with 17 scoreless innings for Hagerstown, he got bumped up and spent the rest of the season there. Despite his lowly draft status, Walsh has now impressed at every stop and owns a career 1.65 ERA across the various Rookie/A-ball levels. Maybe its time to give this guy a shot at AA? At the very least he looks like a left-handed specialist in training. Trending up. Round 35: Lukas Schiraldi, Juco RHP from Texas. Did not sign; instead transferred to U Texas. Drafted in 2014 in the 15th round by Seattle, but he has since struggled as a low-A starter, with two straight seasons of 5+ ERA. Round 36: Reid Humphreys, HS SS from Missouri. Did not sign. Honoring commitment to Mississippi State. Round 37: Karsten Whitson, RH starting pitcher from Florida. Did not sign, returning to U Florida for his senior/4th year. There’s plenty of cautionary stories about Whitson, who turned down 1st round money and eventually was drafted by Boston in 2014 as an 11th rounder (likely bonus; max of $100k). His pro season looks like its a struggle right now; he had just 7IP in 2014, and was listed as “inactive” for all of 2015. Hate to see such a promising arm apparently fizzle out. Round 38: Caleb Hamilton, HS SS from Washington State. Did not sign; honoring commitment to U of Washington. Round 39: Robbie Tenerowicz, HS 2B/SS from California. Did not sign; honoring commitment to UC Berkeley. Washington sure loves 2nd basement from Cal-Berkeley, doesn’t it? See Tony Renda in 2012 or Jeff Kobernus in 2009. I’m sure we’ll revisit Tenerowicz when the time is right. Round 40: Shaun Anderson, HS RH starting pitcher from Florida. Did not sign; honoring commitment to U of Florida. The 2013 class is being whittled down quickly; of the 39 initial names, 11 never signed and another 13 have already been cut loose. That only leaves 15 guys to draw conclusions from. I think its safe to say the loss of the 1st rounder and the failures of our 2nd rounder severely dampen this draft, but Voth and Simms give us some promise. I also like what we’re seeing out of long-shots Thomas and Walsh, with some lingering hope that the youngster Ward could make the leap. Meanwhile, two important names out of this draft (Pivetta and Ott) were used to acquire important players; especially Ott’s role in acquiring two every day players of the planned 2016 25-man roster. 26 Hampson, Garrett SS HS did not sign: Long Beach St.